Click on map to enlarge The map on the left shows the route that Guenter has already ridden! In a recent email to The Long Riders' Guild Guenter wrote to say that he and Barbara were not out to impress anyone, or to break any records. Guenther and Barbara reflect The Guild's belief that equestrian travel should be about riding towards your dreams, not treating your horses like rented cars, or worshiping mileage. The team left on 27 September from Cuenca, Ecuador, bound for the coastal city of Esmeralda. They are unsure what will happen when they reach there - either put the horses on a ship and sail them to Panama - or attempt to cross the infamous Darien Gap jungle of Columbia! Either way, the equestrian explorers plan on being out of Ecuador before this Christmas. Barbara also sent us an email to say, "What makes the difference in travelling by horses is the people you meet on the way. They are so helpful, and you find friends." Barbara emailed The Long Riders' Guild a couple of weeks ago to update us on the intrepid duo's progress. Ecuador, Esmeraldas, Guayaquil, and even to Buenaventura in Colombia to see if we could catch a boat. but either they go to the USA first, or they are not allowed to take horses, or something else. 8th January. The day before they contacted us to say that they don't have the papers ready. They didn't have the boxes for the horses either, so they delayed us for one week. In the meanwhile my visa ran out, and the permits from the Ministry of Agriculture for all our animals ran out as well. So we had to go through all that paperwork again. There are lot of health requirements for the horses - but the best is that not even one veterinarian ever looked at the horses! Luckily we have a friend who is a lawyer and knows the Minister of Agriculture. This helps a lot: you only obtain something here with money or with good relations, there are not really any laws which apply to every person. The people from the airline told us that all our luggage, and Guenter and I could go on the flight, too. Just as we were walking into the plane, they told us "no, only one person can go." So I was stuck in Quito again, with no luggage, no clothes, no nothing - only the clothes I had on me, and my camera, and some money fortunately. The airline refused to pay me a ticket to fly to Panama. but Guenter had been clever enough to make a written contract with them, mentioning that two of us would be on the transport, too. I went back to the lawyer and he helped me get a ticket after 4 days. Now we are both here in Panama, only all our animals are still in quarantine at the airport. (we only have 3 right now, since my mare was pregnant.) The customs people have never had this situation of horses being in transit. They want some money for sure. maybe they want some deposit, to make sure that we leave the country... And we heard that there will be kind of the same procedure coming up for Costa Rica as well! Now I understand Guenter who told me beforehand that the biggest problem is the bureaucracy. Well, we just file it under "part of the adventure". Click to enlarge photo of the team in the jungles of Panama. 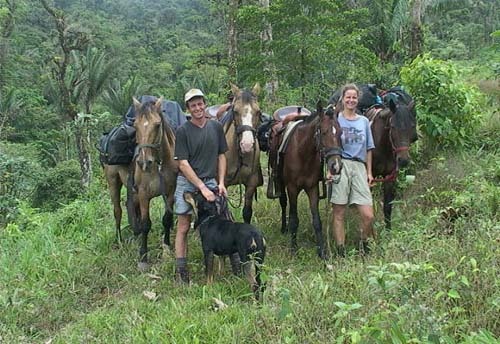 "We are proceeding well through Panama with our horses, and will reach Costa Rica soon (still 250 km to ride). Most days we get up pretty early, around 4 am (who says this is some kind of holiday??!!) to avoid the heat of the day, mostly for our dog Liesl. The grass is not of good quality, so we have to give our horses enough grain (Guenter is just doing that, while I am doing the "technical stuff" here in the internet place.)" "We just crossed the border to Costa Rica today. Everything went very well, it only took us two hours! Then, after a couple of hours in Costa Rica, we had the heaviest rainfall I ever experienced. We were soaked in seconds, and my horses got very spooky about the rain, and the traffic splashing water all over the place. Luckily, a car stopped and this nice guy invited us to stay at his house, only 500 yards away. So now we have a room, a BED, a HOT SHOWER, things you start to appreciate more and more when they become so rare and you are soaked....!" We wish them luck and safety on this epic ride. 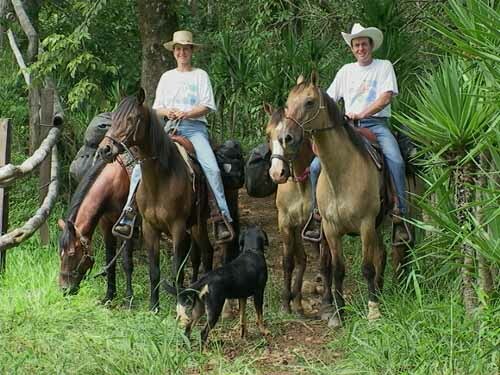 Guenter and Barbara are pictured in the rain forest of Costa Rica, wearing their Long Riders' Guild T-shirts. Clockwise from left: CuChullaine O'Reilly, Guenter Wamser, Barbara Kohmanns, and Basha O'Reilly. Guenter and Barbara visit Kentucky horse country! They have got as far as Costa Rica, found a safe place to leave their horses, and are now back in Germany for a few months. But they went to the trouble of driving all the way from Miami to Kentucky in order to visit CuChullaine and Basha O'Reilly and swap tales of equestrian travel! Guenter and Barbara returned to Costa Rica at the end of December 2002. Gaucho has had terrible hoof problems, and, sadly, will not be able to do any more travelling. Their friends, Uwe and Barbara, have offered to give Gaucho a good home on their ranch in Costa Rica. 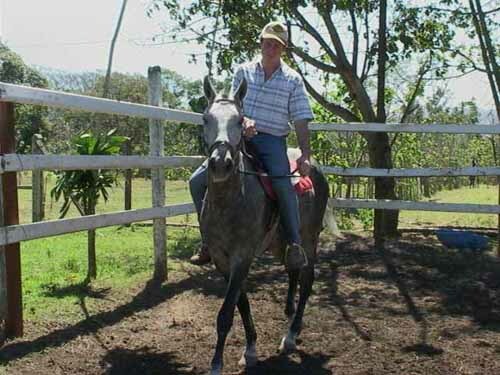 Guenter has therefore had to buy a new horse, a four-year-old grey gelding called Maxl. "He seems a very good horse, reliable, not excited about ropes and dogs, we do not know yet about difficult trails, swamps and rivers, but I am sure we will get him through all that," Barbara wrote in an email to The Long Riders' Guild on January 14th. Barbara has written to The Long Riders' Guild with an update. "We are making good progress here in improving our equipment and training the horses. Maxl is doing very well, learning fast. We will have to house-sit house and dogs here for a few more days, and we hope to be able to leave next weekend."